An owner of a stud farm has hit out at ‘pathetic’ council officers who insist that a new landscaped bridleway she has laid is a ‘trip hazard to horses’. Seasoned horse rider Emma Phillips, who runs Quainton Stud at Lower Denham Farm paid £3,000 for the new path. But Bucks County Council officers are saying the granite edging on the path ‘poses a tripping hazard to horses’, and are asking Mrs Phillips to rip it up. 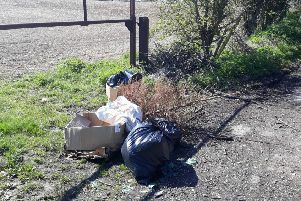 Mrs Phillips, who grew up riding horses and has owned the stud farm for 11 years, said: “All they need to do to resolve this problem at no cost to the council is to certify the path, then everyone can move on and stop wasting time and money. The bridleway was laid as part of a diversion order applied for by the Phillips family, as they wanted to correct an historic route error on maps of the farm dating back to the 1950s. But the problem came about because Bucks County Council officials admitted they forgot to mention that particular section of bridleway in their diversion order. Now, Mrs Phillips says her lawyer – who specialises in footpath disputes – warns the council could be billed for damages in excess of £10,000. They’ve been out on so many site visits but they’re digging their heels in. It’s pathetic. In response Lesley Clarke, county council cabinet member for planning and environment, said: “The bridle gate Ms Phillips has built and the accompanying landscaping appear impressive and we know she has gone to some considerable effort and expense over this. “However, these works and others were not agreed with the rights of way officers and, as a result, there are some major practical problems that have to be overcome. “The county council, and in effect the taxpayer, will be responsible for maintaining this bridleway and we have a legal and moral responsibility and a duty of care to ensure it is totally safe before we can allow it, so to avoid it becoming a maintenance liability on the council in future years.